A flying fortress along with a fleet can also be sent on an ’attack’ mission - then it behaves like other units, for example, it participates in specific rounds of combat and greatly contributes to them. sending a fleet without a flying fortress on an ’attack the platform’ mission will not destroy the platform. All fleets stationing and supporting the island counts together as a defending fleet. Attackers however cannot combine their fleets to attack as one! During the air combat phase, the aggressor’s Ships attack defender’s Ships, protected partially by a Shield active on the island and supported by anti-air Defense Systems. 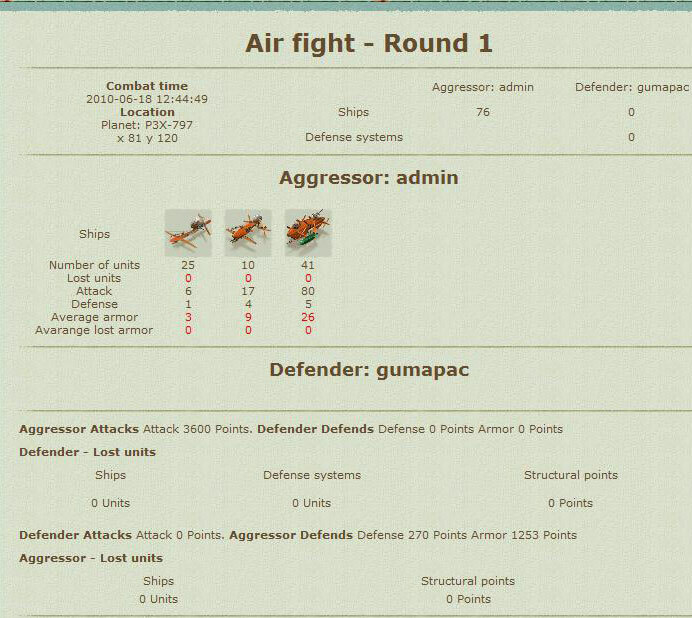 If at some stage during air combat the defender’s all flying units are destroyed, the combat goes to the land phase. Then, the parties of the conflict are the aggressor’s Land units (transported by carriers) fighting with the defender’s Land units and his anti-ground Defense Systems. Remember - in order to win the combat and rob raw materials from it you need a land unit in the attacking fleet. In order to be able to take a land unit with the fleet, you will need a transport ship in that fleet. The combat is over if either party loses more than 80% of total ships it consist of at the beginning of the combat. If attacker looses at least 80% of his ships, he looses the battle and the combat is over. If defender looses at least 80% of his ships, the land phase of a combat begins. Attention - this statement is not true for the fight being an effect of the ’Attack Platform’ order. Such a fight doesn’t end automatically in case either side loses more than 80% of its forces. If less then 80% of flying units of the defender are destroyed during up to 6 rounds of air combat, the defender wins the battle and attacker must withdraw his forces. If the attacker doesn’t have at least 1 transport with land units in it at the beginning of the land phase, he looses the combat and withdraws his remaining forces. If all enemy’s land units are destroyed - the combat ends with a defeat of the enemy. If all defender’s land units are destroyed, the aggressor wins the combat. After his victory, the aggressor takes as many raw materials as he can load onto his ships, taking into account the restrictions imposed by the treasury - a resource inventory you cannot plunder. Technologies owned by the player also influence the course of the war (they affect the parameters of the attack, defense and units’ armor). Also heroes’ bonuses, the Admiralty building and the random probability factor are taken into account for each party. At the end of each combat round its result is calculated. the total attack of one player is reduced by the total defence of his enemy. The remaining number (which means the combat damage) is divided equally between all enemy’s units. If damage received by any unit is equal or greater then its armor value, this unit is destroyed. If not, the unit is damaged (its armor is lower) until the end of the combat. After the combat ends, ships ’heal’ themselves bautomatically to full armor. the flying fortress is an exception here. Most of units have a bonus against other units. even if a unit is destroyed after a round of combat, its bonus counts for this round and destroys additional number of certain enemy’s units, if they exist. For example, if a ship has bonus: raider x3, it means, that each 1 such ship destroys 3 enemy raiders at the end of each round in which that ship participates. During the combat both players (the attacker as well as and defender) can send more fleets to support their own units engaged in the battle. This support will be combined with the existing player’s forces for all the remaining combat rounds (the number of units, total attack, defence and bonuses against other units - each of this characteristic is combined). The players who are in the same alliance can send each other a fleet with a ’support’ mission, which supports this player fleets in defending the island. The chance of destroying the Platform depends on the number of Super cannon modules attached to a Flying Fortress. The aggressor can withdraw at any time from combat using the ’turn back’ button available on the battle screen. Each destgroyed ship produces some debris after a combat. They are visible on the main map as ’black spots’ on the island near which they are located. To be able to acquire raw materials from destruction fields, the player must create a fleet containing a Debris Collector ship. Then, this fleet has to be sent on a ’Collect debris’ mission to the coordinates where the war was carried out. The fleet reaches the specified destruction field in a specified time and then begins to collect raw materials located there, which takes some time. Upon collection of the raw materials, the collector returns to the island and the raw materials are added to the global resources of the island’s raw materials. During the operation of collecting raw materials, the collector is not exposed to any attack. Please note that any player can perform such collecting to take advantage of rew materials left after combat, so keep an eye for such spots on the map. Number of units indicates the number of units involved in the combat after the round. The number of aggressor units is 0, because during this round he has lost all his units. Lost units determines how many units the player lost during the round. Attack shows the unit’s attack potential. Defense shows the unit’s defense potential. Average armor shows the average armor of all units of a given type. The red color means a potential reduction in armor as compared to the base value. Average armor lost shows an average loss of armor units of a given type. The defense field is specified in the defender’s section. However, as its defensive capability is equal to 0, we can guess it had not been charged before the combat. 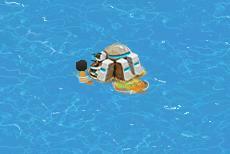 - the name of the owner of the island/deposit - if the island/deposit has an owner.